Authorities are offering a $10,000 reward for information leading to the return of Kayleah Wilson, the 12-year-old Greeley girl who disappeared more than a week ago. "There are people who may know something and haven't come forward with it," FBI Special Agent in Charge Jim Davis said during a Monday afternoon press conference. "We're hoping that by offering a reward, we may drive those folks into coming in to talk to us." Colorado authorities are appealing to a missing girl to come home if she can, and they assured her she’s not in trouble. Authorities don’t know if she was abducted or ran away. Police and FBI officials said Monday it’s possible she’s simply too frightened to return because of all the publicity her case has received. Jim Davis, special agent in charge of the Denver FBI office, says the longer Kayleah is missing the more concerned authorities become. Authorities announced a $10,000 reward for information, saying they believe someone may know something about Kayleah’s whereabouts. They say they have gone to 1,000 houses and pursued 300 leads. Authorities say they still don't have enough information to issue an Amber Alert for a 12-year-old Colorado girl reported missing on March 28. Greeley Police Sgt. Joe Tymkowych says officials haven't determined if Kayleah (kay-LEE-uh) Wilson ran away or was abducted. She went missing after leaving her home to walk to a birthday party in Greeley. Amber Alerts go out instantly via text to cell phone subscribers and to radio and television stations. They also are posted on electronic highway signs to alert motorists. Criteria for Amber Alerts include information that a child may be in danger or vehicle and suspect descriptions. Colorado's Amber Alert managers say the criteria are there so that the public doesn't ignore alerts when too many are issued. Good Advice Jeanne! I agree with you and raised my kids that way and now I'm the parent of wonderful adult children. They make their children "tow the mark", too. Kids want boundaries; though they might tell you otherwise. It's proof that their parents them! It sounds to me like LE has reason to believe that she ran away...I just don't remember it continuing to be mentioned as long as it has in this case...Maybe a fight with Mom before she left? Other clues that they've come across? I just hope she is OK and will be found soon. BJ it is not sounding good for that little girl? My fingers are crossed that she is hiding and afraid to come home but my heart says..it might be something worse. I hope LE is checking all apartments and for secret areas in those apartments and not just the registered SOs. "The possibility always exists that we frightened this young lady into 'Gosh this is such a serious thing, now I'm afraid to come in,'" said Greeley Police Chief Jerry Garner. Despite pleas from her mother other family and friends, they've found no trace of Kayleah since she left for a birthday party a week ago Sunday afternoon. However, police say there were a few sightings of Kayleah at Greeley Mall sometime after she said 'goodbye' to her mother and headed for the party a few blocks from the family's apartment. "It's pretty clear that the longer this (search) goes, the more concerned we get about our ability to bring her home safely," said Davis. While authorities will not share what -if anything- they have uncovered about the girl's disappearance, they still say there is no evidence of foul play. But they're not ruling out anything, or anyone, including family, stranger or someone the girl may have trusted. "We don't have any evidence of foul play, that she was grabbed, but we have to assume," Davis said. And they sent Kayleah a message Monday. "We want to get you in here safe. We want to get you back to your family. You're not in trouble. We're not going to put you in jail or anything like that," said Chief Garner. Kayleah at the mall? All they have to do is roll those video cameras and they will know..yes or no it was her. Gosh what's it take. She might have been with a recognizable boy or a friend they can trace. A videotape that shows 12-year-old Kayleah Wilson walking by the mall Sunday afternoon shows the girl made it that far in her reported walk to a birthday party that afternoon, an FBI agent announced Monday. Also Monday, Greeley Police Chief Jerry Garner spoke as if he thinks Kayleah might still be alive when he made a plea to the girl to come home. “We want you to get back safe,” Garner said. “You're not in trouble. You're the person we're trying to help.” He said he wanted to make sure Kayleah is not hiding out, afraid to return now that the case has turned into a national media event with so many officers and agents involved. The girl was last seen by her mother March 28 as she left their home across the highway from the mall. She said she was walking to a birthday party south of the shopping center. FBI special agent-in-charge James Davis said authorities have located surveillance video that shows Kayleah outside the Greeley Mall, apparently en route to the birthday party, which was in the 1900 block of 30th Street. She appeared to be all right at that time, walking alone. The FBI did not say exactly where outside the mall she was walking, nor where she was supposed to meet a friend. Although they've received more than 300 tips and have been to 1,000 homes in the investigation, officials said Monday they believe someone out there knows more about the disappearance of Kayleah. The FBI also announced Monday it is offering a $10,000 reward for information that will lead to the girl's return. “We believe there's still information out there with people who haven't come forward yet,” Davis said. The number of law enforcement officials on the case has reached close to 100, with Greeley police, the FBI and the Weld County Sheriff's Office involved. Sheriff John Cooke said Monday that 16 full-time deputies, another 15 Weld County Sheriff's Posse members and several volunteers are helping with the case. There are 45 to 55 FBI agents working at different times on the case, and 25 to 30 Greeley police officers. Davis said authorities would not talk about the girl's family or whether there was any discord. He said to remember that Kayleah is a preteen and difficult discussions occur between parents and their children. Meanwhile, police and agents continue to go door-to-door in the neighborhoods around the girl's house and near the Greeley Mall. Monday afternoon, divers from Union Colony Fire were again at the ponds west of the Home Depot on 35th Avenue, where the Greeley Elks Club Golf Course once stood. Six dive team members waded through the waist-deep water, probing the bottom with long rods. Dive teams may search other lakes this week. They were not following specific leads, but just checking different lakes in the area at the request of the FBI. Ken Turner is the cousin of missing 12-year-old Kayleah Wilson and said Monday that the family hopes she has just run away and is hiding out, too afraid to come home. He said they have no knowledge that she simply ran away, that none of her friends have told the family that information, but they want to make sure Kayleah knows she's welcome to come home. Turner, who is the designated family spokesman, also said Kayleah's cousins in surrounding towns — Eaton, Gilcrest, Fort Morgan and Brush — have all walked the fields surrounding their towns and searched for any evidence of the missing girl. He said family members have been estranged from each other for many years, but Kayleah's disappearance has brought them back together. Greeley police and the FBI have called a press conference for this afternoon regarding the disappearance of Kayleah Wilson, the 12-year-old Greeley girl who vanished eight days ago. However, officials in the case have not said there is new information, and the conference is just an update. The conference will be at 2 p.m. at the Greeley Police Department, where one other press conference was called last week about the case. “Greeley Police Chief Jerry Garner and FBI Special Agent in Charge James H. Davis will update the media regarding the on going investigation into Kayleah Wilson,” according to a press release this morning. They are wise to hold these press conferences. Keeps Kayleah's name in the news and her picture on the screen. Nothing new on little Kayleah? Thought for sure she would be found and home. Not good. I keep thinking back to the boyfriend and the fact that they had just broken up. Idk, but I think I'd be looking at him a it harder. Any news in this case? If she was hiding out, at her own will, the possible places would be limited and she would have been found by now. I fear this will be another sad case to read about. Nineteen more people joined the search for Kayleah Wilson on Monday, combing the fields in and around Greeley, but again, no evidence was found. For more than two weeks, the Greeley police, Weld County Sheriff's Office and the FBI have been searching for the missing 12-year-old Greeley girl, and on Monday they also reported there was nothing new on the case. Despite numerous searches, door-to-door inquiries and a $10,000 reward, the girl's disappearance remains a mystery. 30 sheriff's deputies, mounted posse members and other volunteers. Over the weekend, 141 volunteers combed the fields in and around Greeley, working with the Laura Recovery Center for Missing Children, a Texas group that came to Greeley to organize the search. It was the same group that had 19 searchers out on Monday. The organizer for the Laura Recovery Center, Bob Walcutt, said he and his staff left Monday afternoon to go to a conference in Albuquerque, N.M., on missing children. Anyone with information about the missing girl is asked to call the Greeley police at (970) 350-9600 or the FBI at (800) CALL-FBI. Hoping to attract more tips on the Kayleah Wilson case, the FBI is doubling the reward and giving tips about what could be the odd behavior of a possible abductor. »People who come up with an excuse to leave this area unexpectedly for what may sound like a good reason, such as a work-related move, visiting a distant relative or friend. »People who have missed work, called in sick, or asked to change shifts, particularly on days close to when the girl went missing. »People with unexplained recent injuries, such as cuts or bruises on the head, hands or arms. »An unexpected or sudden interest in the status of the investigation, paying very close attention to the media or avoiding conversations or activities related to the case. »Minimizing or denying a known acquaintance with Kayleah. »A recent display of nervousness or irritability. »An increase or decrease in expressing religious beliefs. »Changes in routine sleep patterns. »Changes in the “usual” consumption of alcohol, drugs or cigarettes, either an increase or decrease. »Shaving off facial or head hair, or growing a mustache or beard. »A person who is no longer driving, or changes the appearance of his or her vehicle for no obvious reason. These include suddenly keeping it in a shed or garage, covering it, painting or selling the vehicle, or reporting it was stolen or given away. The reward in the case was raised to $20,000 because the investigators haven't been getting as many leads in the case in recent days, said Special Agent-In-Charge Jim Davis. The 12-year-old girl disappeared almost three weeks ago when she left home to walk to meet a friend for a birthday party. She hasn't been seen since. In addition to the increased reward, the FBI also announced Thursday that they are cutting back on the number of agents who are in Greeley working the case. At one time, more than 50 people from the FBI were on the case, but because of the decrease in leads, they are cutting back. It’s been three weeks since Kayleah Wilson disappeared on the way to a birthday party in Greeley, Colorado on March 28, 2010. Search parties and volunteers have combed rivers, ponds, ditches, and conducted door to door searches, yet the clues are slim and the search has slowed. Over the weekend, rain hindered another search for Kayleah and the search ended at 2:30 p.m., as rain continued to fall. The search has even gone to social media networking sites such as Twitter and Facebook. Anyone who has tips or information regarding Kayleah’s whereabouts or the events surrounding her disappearance is urged to report the tip. According to the Greeley Police Department http://greeleygov.com/Police/default.aspx there is nothing to indicate that Kayleah Wilson ran away, while at the same time there is no evidence that indicates she was abducted or that foul play was involved. Police are relying on the public’s help to locate Kayleah and the FBI has offered a $20,000 reward. Stories of a missing Greeley girl being found — or her body being found — continue to circulate throughout Greeley and stream into the Greeley Police Department and to the missing girl's family. The stories aren't true, and they're difficult for the family. April Wilson said her 17-year-old son — Kayleah's brother, Mackenzie Wilson — hears the stories at school, the family gets calls at home saying she's been found, and her friends have also been receiving calls and text messages relaying the false stories. “We just wish people would stop,” April Wilson said. The number of officials working the case has dropped significantly since the girl was first reported missing. There are now two Greeley detectives, two FBI agents and two agents from the FBI's Behavioral Science Unit working full-time on the case. They still have a control room set up where they take tips and keep material and information on the case. Kayleah Wilson disappeared March 28 after she left home to walk to meet a friend for a birthday party. She apparently crossed the U.S. 34 Bypass on foot and walked through the Greeley Mall parking lot that afternoon; police have surveillance photos showing her alone in the mall parking lot. The case has brought widespread publicity and more than 50 FBI agents came to Greeley to investigate the case for two weeks. Police also released information about a 44-year-old man who was termed a “person of interest” in the case. The man, who once lived in two apartment complexes south of the Greeley Mall, was contacted and cleared. The Behavioral Science Unit team from the FBI recently issued a list of behaviors that could fit a suspect, if indeed the girl has been abducted. Those behaviors include changing cars, growing or shaving off a beard, or becoming abnormally interested in the case. The reward for information that leads to the closure of the case was raised to $20,000 because the investigators haven't been getting as many leads in recent days, said special agent-in-charge Jim Davis. The mother of the Greeley girl who has been missing since March 28 is asking people to join a search for her daughter Saturday in Windsor. Kayleah Wilson,12, left her Greeley home to walk to a birthday party, but never arrived. Greeley Police and the FBI remain stumped. They say they have yet to determine whether Wilson was abducted or ran away. To keep the case in the public eye, Wilson's mother, April Wilson, has helped organize a community search. The search starts at 9 a.m. at Medigrow in Windsor. The address is 1292 Main Street, Unit 1. Wilson says the search will last through the evening. GREELEY, Colo. - Police were investigating the discovery of a body in west Greeley Wednesday not far from the home of a missing girl. A police spokesman said the body is too badly decomposed to determine if it is a male or female. The body was found less than a mile from the home of 12-year-old Kayleah Wilson. The 6th grader has been missing since March 28. Reports said Kayleah's mother, April, was notified that a body had been found. A victim's advocate from the Greeley Police Dept. was at the family's home Wednesday morning. Police say an employee of a ditch company found the body near 35th Ave. and U.S. 34 Bypass. Sgt. Joe Tymkowych told the Greeley Tribune the worker was checking the narrow ditch for any problems following Tuesday's heavy rains at about 6 a.m. Wednesday. He came to a gate and when he opened that gate, as he always does, he noticed the body and contacted police. The ditch runs underground behind the former Kendall Printing building, behind Trinity Lutheran School as well as Sunset Memorial Gardens cemetery. A dive team from the Union Colony Fire Rescue Authority recovered the body just after 10 a.m.
Tymkowych said that area has been searched at least twice for Kayleah Wilson, the 12-year-old girl who has been missing for almost two months. She was walking to a friend's birthday party when she disappeared near the Greeley Mall. A team from the Weld County Coroner's Office was on site where the body was found. Tymkowych says investigators planned to use dental records and possibly DNA and hair fibers to identify the body. That does not give me much faith in LE searches when bodies are discovered after their searches. Thanks for posting this and I will be watching this story. She might not have been killed there. If a dive team had to get in to get her, she could have been frozen in ice or floated up. Sorry to be graphic. I hope it is her so her parents don't have to keep wondering. I knew it was gonna be a bad day. Dozens of Greeley residents, including friends of 12-year-old Kayleah Wilson's family attended a candlelight vigil Wednesday evening along a drainage ditch where a body was located earlier in the day. "It hurts me and I don't even know her or her family, so I can't even imagine what they're going through," one woman who attended the vigil said. "I've lived in Greeley for 10 years and I never thought anything like this would happen." Kayleah's mother, April, did not attend the vigil. She was notified early in the day that a body had been found, and a victim's advocate from Greeley Police visited the family's home. "Hopefully this isn't her, (but) if it is...may she rest in peace," said Cyndi Rogers, a family friend. "If not - Kayleah, we're not giving up on you." Kayleah Wilson vanished March 28 from her Greeley neighborhood. A body recovered from an irrigation ditch in Greeley has been identified as that of a missing 12-year-old girl. Greeley police chief Jerry Garner announced at a 4 p.m. news conference that dental records confirmed the body found Wednesday is Kayleah Wilson. They said the death is being investigated as a homicide. "The Weld County coroner has confirmed this was not an accident," Garner said. Kayleah has been missing since the afternoon of March 28, when she left her mother's apartment in west Greeley to walk eight blocks to a friend's birthday party. She was supposed to meet a friend near the Greeley Mall, and they were to walk to the party together. But Kayleah never met the friend and did not show up at the party. Professional and volunteer searchers have looked for Kayleah in Greeley and other parts of Weld County since she disappeared. Garner declined to speculate at how long Kayleah was in the water, but said it was "for some time." The department is now adding investigators to the case, and will begin focusing on what Garner said was a "wide range" or potential suspects. "We do not give up," Garner said. "We've got a lot of work we've got to do." A badly decomposed body found in Colorado yesterday is that of missing 12-year-old Kayleah Wilson, police said today. Kayleah Wilson was last seen Sunday afternoon when she left her mom's Greeley, Colo., home to go to a friend's birthday party. Kayleah never returned. The body, found Wednesday just one mile from where Kayleah went missing nearly two months ago, was identified through dental records, said Greeley, Colorado, Police Chief Jerry Garner at a press conference today. "The Weld County Coroner's Office has identified the boy as that of Kayleah Wilson," said Garner. "The information that has been provided says that the death does not appear to be accidental and as a result, a homicide investigation has begun." Digital Trail: Missing Family Left Willingly? The search for Kayleah, who went missing March 28 after leaving her Greeley home to attend a birthday party, has been confounded by an absence of any information or leads, police have said. Today Garner said that there is still little to say about the cause of Kayleah's death or who might be responsible. "We can't guarantee you that there is not someone, if given the opportunity to do this crime again, who wouldn't do it," he said. "We still have a wide range of people of interest that we'll be following up on." "We are looking for a successful prosecution of whoever did this to this girl," said Garner. Kayleah's body was found at 6 a.m. Wednesday by a worker who was inspecting the water levels in an irrigation ditch. Garner said this was an area that had been searched twice by rescue workers when Kayleah first disappeared, and even by search dogs, which never picked up a scent. "The death didn't occur, let's say, within the past day or two, it occured some time ago," said Garner. Kayleah's family was not at the press conference and, according to Garner, does not want to speak to the media. Garner said that there is nothing to lead investigators to believe that any member of the family "is a suspect in the case." Kayleah's mother, April Wilson, said that disappearing without calling or coming home was not typical of her daughter. "She's never run away before," Wilson said after police began to look for Kayleah. "I am worried she may be in danger because none of her friends have seen her, and it is like she just vanished, but that's not possible." Kayleah, a sixth grader at Brentwood Middle School, was last seen wearing a white-and-pink shirt over a white tank top, blue jeans and white and red shoes. She was described as being 5 feet 1 inch, and approximately 145 pounds with brown eyes and brown hair. Wilson said her daughter left at 3:40 p.m. for the party, which was just a few blocks away. "She walked over to the couch and said, 'I love you,' and 'I'll be home by 7,' and she walked out the door and that was it," Wilson said. "She had been talking about the party. She was really looking forward to it." The eight-block area Kayleah would have crossed to get to the party is well-populated and safe, according to authorities. Wilson also said that she had no concern about letting her daughter walk alone and that the neighborhood is not dangerous. "We all walk everywhere, we don't even have a car," she said. "It's not a bad neighborhood." Wilson described her daughter as "loving" and "trusting," and said that she's always been well-behaved. Other than that, Wilson said her daughter was a typical preteen who had a crush on one of the singers from the folk band Celtic Thunder. On the morning of the day she disappeared, Wilson said her daughter had gone to church with her and had been happy during a lunch at a local restaurant with her grandmother. Greeley Police Chief Jerry Garner said the body recovered Wednesday is that of Kayleah Wilson of Greeley, who was last seen walking to a friend's house for a birthday party. Garner said Thursday the coroner's office ruled Wilson's death a homicide. He said police know the "manner and cause" of death but he declined to provided details. No one has been arrested, Garner said. No one has been ruled out as a suspect, but investigators have nothing that points to family members, Garner said. Authorities received additional tips on the case after the body was recovered, and police will vigorously press the investigation, he vowed. Amalia and Benjamin Bauerman, with their son, visit a makeshift memorial that has sprung up near the ditch in Greeley where Kayleah Wilson's body was found Wednesday. Police say their focus will now shift to finding the 12-year-old's killer. GREELEY — With the mystery over Kayleah Wilson's whereabouts solved by the confirmation Thursday that the body found in an irrigation ditch was hers, Greeley police turned their attention to finding the 12-year-old's killer. "We've got a lot of work to do now," said Police Chief Jerry Garner. "Our pledge in this kind of case is that we do not give up." A wide range of suspects will be reinterviewed and plenty of investigative avenues pursued after the Weld County coroner on Thursday determined from dental records that the body was Kayleah's, Garner said. "We'll be talking to lots of people," he said. The coroner determined that Kayleah's death was a homicide — but Garner would not say exactly how she died. He also would not say how long she might have been in the ditch, which is half a mile from her home but not on the route to her friend's house, where she was going to attend a birthday party. Kayleah went missing March 28, shortly after leaving her family's apartment in the 2800 block of 28th Street. The next day, police began canvassing the area, including an area south of the Greeley Mall. The path she would have taken includes heavily traveled roadways, and police requested an Amber alert be relayed throughout the state. None was issued because there was no evidence she was a runaway, nor was there any obvious indication of foul play. The FBI soon entered the case, and widespread searches for Kayleah ensued but failed to turn up any clues. There were no significant developments in the case until a ditch rider found the badly decomposed body near a water gate about 6 a.m. Wednesday, just a mile or so from where Kayleah was last seen. That same area had been searched at least twice, including with dogs, but Garner couldn't say whether someone had searched the gate where Kayleah was found. Garner also said a video taken of the mall parking lot couldn't confirm Kayleah was there the day she disappeared. Kayleah's mother, April Wilson, was not available for comment. Garner, who spoke to her earlier Thursday, said she seemed a little relieved that her daughter's body had been found. Otherwise, Garner said, "She's upset." The FBI is helping with the case, and a $20,000 reward is still offered for information that leads to an arrest. Any help the public can offer would be appreciated, Garner said. "Maybe something out there is the gem we need to close this case," he said. 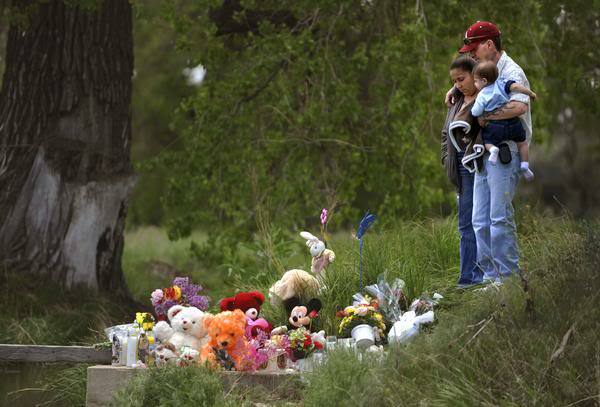 Throughout Greeley, confirmation that Kayleah had been killed provoked sadness — and concern. Rogers, friends of the Wilson family who attended the news conference, said volunteers' efforts to find Kayleah can now be shelved. People should turn to helping Kayleah's family get through the investigation, Fendrich said. "I hope the community can come together and help the family and help Kayleah rest in peace," she said. At a makeshift memorial near the ditch, Melissa Lujan said Kayleah's death has stunned all those who spent weekends and evenings searching for her in March and April. "Her dying like this has hit the community very hard," Lujan said. Also at the memorial, Erica Cruz said the idea that Kayleah might have been snatched and killed on the day she disappeared is "very frightening." "This is especially bad because you don't know who it is," Cruz said. "And he may be out there." Thursday: Police confirm the body is that of Kayleah and that the coroner's office ruled the death a homicide. So they don't know for sure that she went in the direction of the mall...I thought there was video showing her walking by, but the article above says no...I think a witness said they saw her there...I wonder if she went in that direction at all...Maybe she was going to meet someone instead of going to the birthday party...? I missed out on this case somehow, but became aware of it when I heard that her body had been found. It sounds like the suspect would have to be someone from the area. If it had been someone passing through on the highway, they most likely would have left her body a long ways away from the area. Hopefully LE will be able to find out who did such a terrible thing... and may Kayleah rest in peace. Such a sad ending for this little 12 year old girl. My heart breaks for her family. There was surveillance, so she was on her way...but obviously redirected? The dumping ground (xoxo) is not necessarily on her path? Another sad ending...and oddly Kayleah...Caylee, Haleigh, it must be cooincidence of popular name patterns, but wow. Blessings to another sweet child. Speechless, lost. The man accused of having a sexual relationship with Kayleah Wilson, the 12-year-old Greeley girl whose body was found in an irrigation ditch last week, appeared in court for the first time Tuesday. Robert Laurencio Montoya, 18, waived a hearing to reduce his $100,000 bond. A judge set his next court date for June 15. Montoya's public defender, Kevin Strobel, and a woman at Montoya's home declined to comment Tuesday. Police say Montoya's arrest is "separate and distinct" from the murder case currently under investigation. They would not, however, exclude Montoya as a possible 'person of interest' in Kayleah's death. Kayleah Wilson disappeared March 28 after she left home in south Greeley to attend a birthday party. This spawned an intense search involving more than 50 FBI agents, dozens of Greeley police and Weld County sheriff's deputies. Police will not reveal the cause of Kayleah's death, saying it could compromise the investigation and eventual prosecution of a suspect, or suspects in the case. a sexual relationship? She was a bit under the age of consent. Robert Montoya will be in court this Thursday, in preparation for his upcoming trial in the death of slain 12 yr old, Kayleah Wilson, scheduled to begin March 21,2011.
thx Lisette, there are so many cases I get confused sometimes. I would think he will be arrested before too long. In the weeks following the disappearance of Kayleah Wilson, police were in daily, sometimes twice-daily, contact with Robert Montoya. Montoya, now 19, made his second appearance Friday in Weld District Court for a pre-trial motions hearings, where attorneys have presented evidence to be considered at trial. Montoya is charged with sexually assaulting 12-year-old Kayleah from October 2009, when he was 17, to March 2010, during which time he'd turned 18. Though evidence from her mother and brother suggest they knew of only one sexual encounter in the fall, prosecutors believe there were much more. Montoya told police of several sexual encounters, which admissions defense attorneys hope Weld District Court Judge Marcelo Kopcow will throw out. Prosecutors didn't get through all of their witnesses Friday, and they have continued the matter for a second time to later this month, at which time they should argue their cases. Kayleah's body was found May 19 in an irrigation ditch in southwest Greeley. Montoya was arrested that very day, and though he's never been named as a suspect — nor has anyone else — he is considered a person of interest in Kayleah's death. Greeley police report they continue to investigate the case full time. In court testimony Friday, five police officers reported their various contacts with Montoya beginning March 29, the day after Kayleah was reported missing through his arrest on May 19. The first week of her disappearance, police questioned Montoya several times; once, he was visited by two sets of officers in one day — one of which visited him twice. Each time, officers reported they questioned him about Kayleah's disappearance, where he thought she might be and collected evidence, as well as DNA and fingerprint samples from him. What they learned through the conversations with him and Kayleah's mother, was that he and Kayleah had been intimate several times, which constituted sexual assault given their age difference. Montoya had briefly lived with the Wilson family, until Kayleah's mother, April Wilson, said she kicked Montoya out when she learned of the relationship in late December or early January. 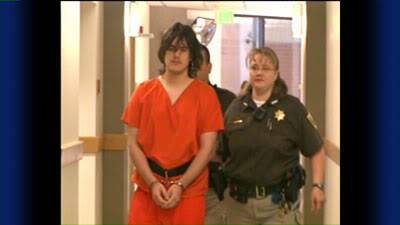 The family reported Montoya continued to “stalk” Kayleah in the following weeks. Montoya provided police with two pages that were torn from Kayleah's diary, and he even agreed to take a lie detector test in which police say he was telling the truth when questioned if he knew where she was. Police, however, never told him how he did on the test. Early on, Montoya told police he had searched for the girl himself. Walsh said Montoya called him the next day to ask if police had found Kayleah. On March 30, police found Montoya at the Wilson home, sitting at the kitchen table, when they arrived to talk with April Wilson. “I was somewhat surprised to see him there,” detective Christian Morgan testified. That day, Montoya submitted to a lie detector test, as well as additional questioning. When police brought him home, he retrieved the torn pages from Kayleah's diary. On March 31, upon two more visits from police, and police collecting DNA evidence from him, he was taken to the Greeley police department for questioning. “Toward the end of the interview, Robert had indicated a willingness to harm himself,” Morgan said. Police took Montoya to North Colorado Medical Center, and he was put on a 72-hour psychiatric hold. The next day, Morgan and another officer visited Montoya at an adult treatment unit to collect fingerprints and palm samples. Morgan said Montoya was in good spirits, as if he were relieved to be there. He then provided officers with a written statement detailing information on which police had questioned him, Morgan said. Police and FBI agents contacted Montoya again on April 7, at which time he was questioned about entries he had made in his journal. Earlier Friday, Kayleah's friend, Avelina Hernandez, 12, testified to a conversation she had with Kayleah at school, after she had seen Kayleah crying, though she couldn't remember what month the conversation took place. Avelina said Kayleah was mad at her when she mentioned Montoya's name. She said Kayleah had complained to her that Montoya had been stalking her and that he was hiding in the bushes, but Avelina said she never saw him. Montoya also was contacted by police on Feb. 19, after which Brentwood Middle School officials had complained of a man peeking in the window. I just can't help but think that he is the one that killed Kayleah, even if he did pass the lie detector test. It just sounds like she wanted him to leave her alone and he wouldn't...like he was obsessed with her. Maybe he couldn't handle her rejection and killed her...JMO. I am glad they charged him with something. I would think they had enough circumstantial evidence to have a Grand Jury consider charging him with murder.